VoIP discount: where's the catch ? How do these guys at VoIP Discount make money ? by charging $0.01 to non-free destinations ? charging for mobile calls? charging for premium services such as VoIP phone number and voice mail ? how does it compare to Skype, Wengo Phone, VoIP Buster, Rebtel and the Gizmo Project ? I haven't been following the VoIP market lately. Thanks. 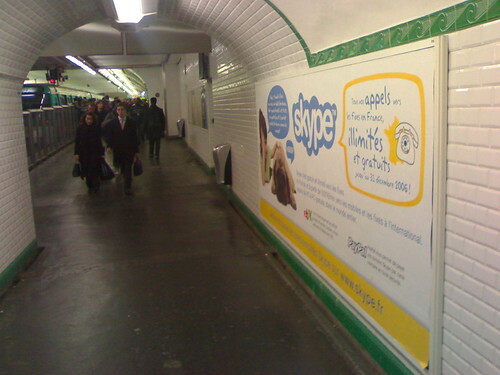 Skype ad in the Paris metro, originally uploaded by rsepulveda. Shot taken in the Paris metro on 8 november 2006. To understand the title, please link here, to Martin's blog. I wrote about Rebtel only a few hours ago. Seems to me that mig33 is offering something similar ? (funny, I was looking today at my Google Adsense reports, and was wondering who on earth would click on my * a d s * every day. here I go I clicked on one on LinkedIn just a few minutes ago, and that’s how I discovered the service). And you thought VoIP made you anonymous. Amazing story here. 3) you’re charged very low rates (local calls) + $1 USD/week. If you call often then you make money. The $1 USD seems like a lot it you only place ONE call a week. 4) there’s a callback mechanism where when you call someone, they pick the phone, hang up, and call back. And then the international call is free. All of this, while we wait for Skype to come up with a mobile version … (I’ve seen it with my own eyes already , although it’s not for public release AFAIK). Update: taken at the CES camp with my Nokia N90. More information on the skypejournal.com. 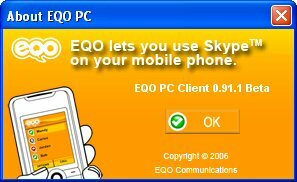 Phil gives us his top 2 predictions for 2006 related to Skype, and his 2 dream features for the next release of Skype.